The Canadian Produce Marketing Association (Half Your Plate folks) hired me to work on a recipe and video series and I’m delighted to share it here with you! OK I’m not a big fan of the word superfood because I darn well know as a dietitian it’s what we eat day in and day out that really counts but here I go and break my own rules – this is one heck of a way to pack 4 superfoods into one bowl and the drool worthy lemon tahini dressing? I have ideas for more ideas to use that too! Check it out (recipe below). This recipe only uses 4 carrots so if you have a few extra lying around and need some new ideas to use them (aren’t we all trying to curb food waste?!) here’s Carrots 4 Ways. Dietitian's Tip: Quinoa seems to be the hot grain these days but did you know we don't grow a lot of quinoa in Canada but we do grow a heck of a lot of barley so feel free to swap out the quinoa for barley, another ancient grain that's proven to help reduce blood cholesterol (and costs ⅓ of quinoa!). *Kids Cook! Younger kids can tear the kale leaves from the stems and older kids can (with supervision) peel the carrots into pretty ribbons. Rinse 1½ cups of tri-coloured quinoa (or barley). In pot with 3 cups of simmering water add quinoa and cook until tender, about 20 minutes. On large rimmed parchment lined baking sheet, toss 1 bunch of kale, stems removed and coarsely chopped with 4 carrots, washed and peeled into long ribbons (or spiral cut) with 2 tbsp canola oil, ½ tsp EACH coarse salt and pepper. Roast in oven at 425°F until kale is crispy and slightly charred, about 10 minutes. 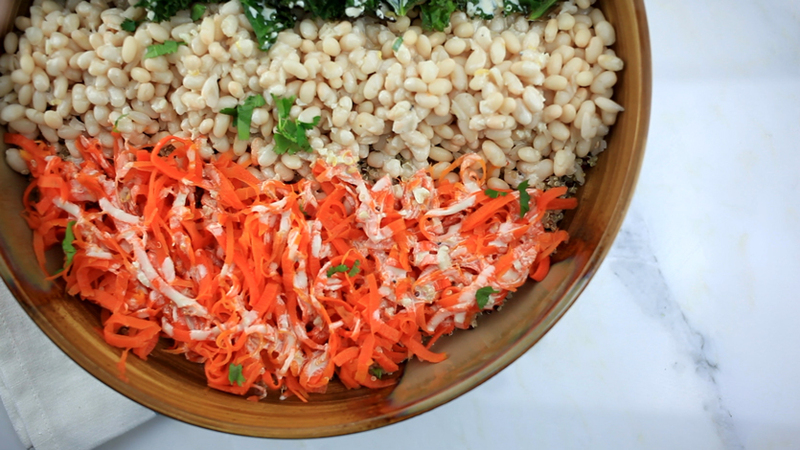 In large shallow bowl, place quinoa in one section, carrots and kale in other areas and 1 can white beans (rinsed) in another area. Drizzle with lemon-tahini dressing (see recipe below). Toss together. Lemon-Tahini Dressing: In bowl, whisk together ½ cup tahini, ¼ cup water, 1 tsp minced lemon rind, 2 tbsp lemon juice, 2 cloves garlic, minced, ¼ tsp EACH salt and pepper. Add more water, if needed. Tip: You can easily double this dressing recipe. Make-ahead: place in airtight container for up to 2 weeks. Give a good shake or stir before using. Add more water, if needed. • Toss leftovers into a container for lunch. Bump up the protein (to help you feel full longer) with a hard-cooked egg on the side or more canned beans or lentils or chickpeas (about ½ cup) and even a sprinkle of pumpkin seeds for added crunch. • Toss leftovers into a wrap. If you need extra veggies, add your favourite salad greens. Pack extra dressing on the side if you like. • This power bowl (or Buddha bowl) is a great way to use any leftover veggies such as leftover grilled peppers and eggplant, steam broccoli or snap peas or roasted asparagus. You can basically swap the carrots and kale with any veggies on hand. • Swap out the white beans with other proteins you have on hand. Any other bean or lentils would work. Leftover salmon, trout, chicken or firm tofu would be nice too. *All “Kids Cook!” ideas are meant as a guide only. You know what your child can safely manage. Make sure they understand your rules for safely working in the kitchen. Always supervise kids in the kitchen and have fun! 5 Surprising things to know about carrots – Quiz!